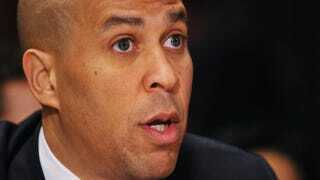 Sen. Cory Booker Is an Optimist—but Can He Break Senate Gridlock? All along the way of Sen. Cory Booker’s political rise, in one way or another he’s been cast in—and played—the good-guy role. He rose to prominence as the upstart Newark, N.J., city councilman depicted in the documentary Street Fight. As Newark’s mayor, he built a national profile by cultivating almost a million and a half Twitter followers, outshining New York’s Mayor Michael Bloomberg with his response to the 2010 “#snowpocalypse,” saving a neighbor from a burning building, and being known as the Democrat who managed to share a good-natured rapport with New Jersey’s Republican Gov. Chris Christie. So to start, he’s put his stock in a bill he’s jointly sponsoring with Republican Sen. Tim Scott of South Carolina—the only other African American in the Senate—that would create incentives for businesses to offer apprenticeships for young Americans in various skilled trades. Their Leveraging and Energizing America’s Apprenticeship Programs, or LEAP, Act would put in place a $1,500 tax credit for each apprenticeship provided to young people under age 25 and $1,000 for apprentices between the ages of 25 and 29. And if it gains momentum and eventual passage, it’ll be a feather in the caps of both Booker and Scott for demonstrating that a newer generation of Senate leaders can break through partisan gridlock. To that end, Booker calls himself “a prisoner of hope” for bipartisanship but also says he’s “a realist” who understands “how difficult it is to get things done.” Particularly when it’s an election year in which the Republican agenda is being driven in the House of Representatives, and Democrats in the Senate have been focused on boosting the minimum wage. His approach is hard to argue with, but he'll be relying on the same Republican colleagues that he's working with now to have that same spirit of compromise, even though, for instance, as a member of the House, Scott voted in 2011 and 2012 to repeal Obamacare, and in the Senate in 2013 to defund it. It's Booker’s challenge as he rounds out his predecessor’s term and runs again in November for a full term—representing a mostly Democratic state while trying to solidify his brand as an across-the-aisle uniter. For now he’s following the advice of former New Jersey Sen. Bill Bradley, who advised him to “sit down with every single one” of the Republicans in the Senate. It’s what a perpetual optimist would say. But since he’s only been in the Senate for six months—and the 113th Congress has been the least productive in history—a perpetual realist might counter: We’ll see.